tenBrultehServer can receive pakets from up to ten ECM/GEMs simultaneously using five different COM or TCP ports. 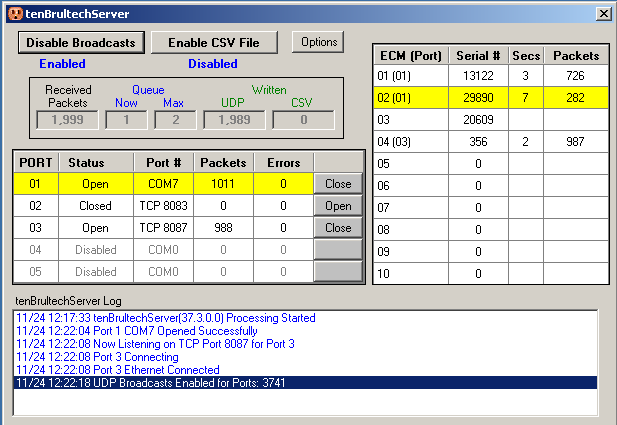 First, configure the COM and TCP ports that will be used to receive packets from your ECM/GEMs. Set the port type (serial or ethernet), and set the port number used for communications with the ECM/GEMs. More than one ECM and or GEM can communicate via a single port. If specifying a serial port, enter the COM port number that the ECM/GEM(s) are attached to. If connecting via ethernet through the EtherBee or EtherPort, enter the TCP port configured for the EtherBee/EtherPort (usually, 8083). You should have already run the EtherBee configuration program that set the TCP port. You also should have configured the EtherBee with the IP address of the tenBrultechServer computer. If connecting a GEM via direct ethernet or wifi, specify the TCP port configured using the EtherX configurator for the GEM (usually 8087) and the IP address of the tenBrultechServer computer. Remember to click the Update button to save your changes. Now that you have configured the connection methods (serial ports and/or ethernet ports) you must configure each of ten ECM/GEMs. First enter the serial number for each ECM/GEM in your system (enter a zero to disable any ECM/GEM entries not used). 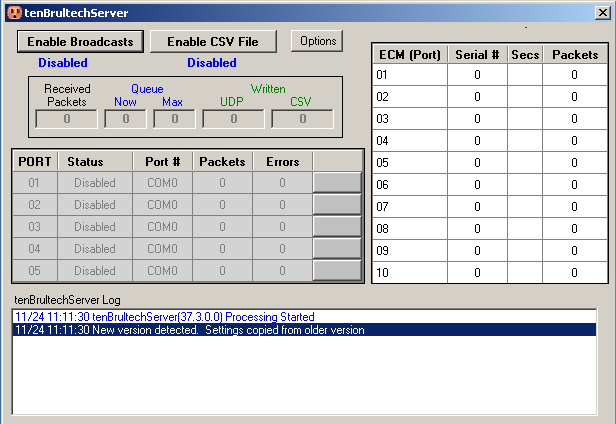 If you are not sure of the serial number of a specific ECM/GEM, enter any unique non-zero number and the log dialog on the main panel will list the serial numbers of any packets that were received from undefined ECM/GEMs, allowing you to update your configuration with the correct serial numbers (note: you must open the port that the ECM/GEM is connected to in order for it to receive the packets and identify any incorrect serial numbers). For each ECM/GEM, you must assign theVirtual Channels you want the data from this ECM/GEM to be assigned. With the capability of connecting up to ten ECM/GEMS, there are now many channels of data available (approximately 440), even if you do not connect any house circuits to each of these channels. For instance, you might have three electical panels in your home, each with a GEM located at that panel, and 15 circuits connected to each GEM. In order to limit the size of packets sent across your network, you define only the range of channels for each ECM/GEM that you use. Instead of broacasting data for 440 channels, we only need to broadcast data for 45 channels. tenBrultechServer supports the processing of up to 199 channels in the initial release. For each ECM/GEM, you specify the First Virtual Channel number to assign to the first physical ECM/GEM channel and the Last Virtual Channel to assign from the ECM/GEM. This identifies how many channels from the ECM/GEM will be used (always the lowest physical channels), and which Virtual Channels to assign to them. IT IS IMPORTANT TO THINK THROUGH THIS CHANNEL ASSIGNMENT CAREFULLY. All clients will receive only the Virtual Channel numbers you define. If you change the assignments in tenBrultechServer, you will most likely have to adjust your clients accordingly (potentially a significant problem if you are saving historic data to a database). You should, therefore, only attach circuits to the lowest channel numbers (specially for GEMs), only define Virtual Channels for physical channels actually used, and leave Virtual Channels undefined between the ranges used for each ECM/GEM (for instance, if you have GEM1 defined to use Virtual Channels 65-82, start GEM2 at say 95 to leave Virtual Channels avialable in case you add additional circuits to GEM1). Remember to click the Update button to save your changes. For the GEM, the first 48 physical channels are energy monitoring channels (current model only uses the first 32, but the GEM transmits 48 anticipating an add-on module that will add an additional 16 channels to the GEM). Channels 49-52 are Pulse Counters, and Channels 53-60 are Temp Sensors. If you are using the Pulse Counters and/or Temp Sensors, make sure you define the First Channel and Last Channel to include these Channels. Then enter the UDP Ports (separated by a comma) to be used to broadcast data to client programs and click the Update button. In most cases, only a single UDP port is necessary. Multiple computers can all receive on this same port simultaneously. In most cases, multiple programs on the same computer can also receive on the same port simultaneously. If you find that you are having difficulty running multiple clients on the same computer using the same port, you can have tenBrultechServer broadcast on up to 3 ports and have each client program listen on a different port. Although tenBrultechServer broadcasts Comma-Separated-Values (CSV) formatted UDP packets and there is a tenEcmCsvLogger program that receives these packets and writes them to a flat file, you can also have tenBrultechServer write the CSV records directly to a flat file. You can change the default folder (but not the file name) in which the records are written by browsing to the target folder and clicking OK. The file name is always tenEcmCsvLogger.csv. When you first start tenBrultechServer, you must manually enable ECM/GEM communications (by clicking one or more Open buttons) and packet Broadcasts (by clicking the Enable Broadcasts button). In the Options dialog, you can specify that you want to automatically open each of the ports, start broadcasting UDP records, start writing CSV records to a file, and minimize tenBrultechServer to the notification area as soon as tenBrultechServer is started. You can then place a shortcut to tenBrultechServer in the windows Start/Programs/Startup folder and automatically run tenBrultechServer unattended.